Do you have a loved one who smokes? Have you tried to get them to stop? Are you looking for a natural product that can help you from smoking? You might want to give Aqua-tine a try. 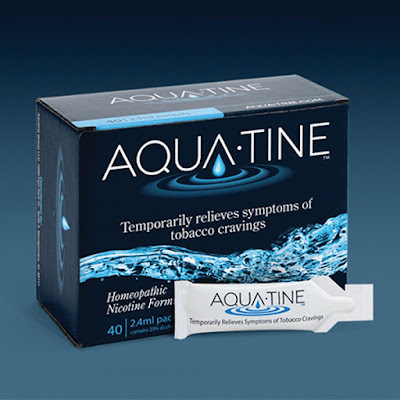 Aqua-tine is a natural homeopathic product that temporarily relives tobacco cravings. It is a small 2.4 ml packet of a natural liquid that comprises of a nicotine formulation. It is tasteless and colorless and all you need to do is to add to any drink. It can be added to any liquid except an energy drink. You are not supposed to use it with any other product that contains nicotine. So, you cannot smoke, chew tobacco and etc when using Aqua-tine. You can use Aqua-tine twice in one hour as long as you take it with water, juice, milk and etc, no alcohol or energy drinks. Aqua-tine has been approved by the US FDA(Food and Drug Administration) and has been approved as on over the counter homeopathic drug. The effectiveness of Aqua-tine has been proven in a 2012 study which looked at Aqua-tine versus a placebo. For more information and to buy Aqua-tine, please go to the Aqua-tine website. I was given a sample of Aqua-tine by the company but I don't smoke so I tried to have my client review the product but she wasn't ready to quit smoking. I decided to have my neighbor give it a try and he agreed to review the product. 1. How long have you been smoking and how much do you smoke? I have been smoking for a long time for more than 20 years. I started in high school. My friends got me started and most of them stopped by the time we graduated. I smoke a half of a pack of cigarettes a day. I don't smoke cigars or chew tobacco. 2. How does your family feel about your smoking habits? My wife and kids do not want me to smoke. They constantly remind me about the risks of getting cancer when you smoke cigarettes but I tend to ignore their threats. 3. Have you ever tried quitting? I went cold turkey one year about 10 years ago but I went back after stopping for two months. 4. Did you have any stop smoking products to assist you? No, I just quit, no stop smoking aids. 5. Did you use Aqua-tine? Yes, I did and I just finished the product. 6. What are the pros about the product? It is not that expensive and it was easy to use. It also saved me a lot of money because I didn't smoke for a week. 7. What are the cons about Aqua-tine? I thought the product was okay but it didn't stop me from craving cigarettes. 8. Would you purchase and use it again? I wouldn't purchase the product. 9. Would you recommend the product? I would recommend the product because it didn't work for me doesn't mean it wouldn't work for others. In fact, a lady in my office wanted to try the product. 10. Has Aqua-tine made you want to try quitting again? It did help me reexamine why I smoke and why I should quit for my health. I might try going cold turkey again and joining a self help group. I want to thank Aqua-tine and my neighbor for this review and I would recommend smokers to a least give it a try, Aqua-tine might just work for you. I will pass this info along to my husband. may just be what he needs.